Hi Guys! Red on Top is having their launch party this evening……if you are in the East London area come pop in and view their range! The other day someone asked me why they should hire an interior designer. This is a topic close to my heart; so this week I thought that I would share a few reasons with you on why hiring an Interior Designer is a must for anyone, with any budget, debunking the myth that that an interior designer is solely reserved for celebs and the uber-wealthy! Yes. You did read that correctly! Designing a home without a designer and trying to stay on a budget is like going to the YDE half price sale and only buying 1 item – it’s not going to happen. You don’t have to be a millionaire to live in a space that looks like you spent money on it. You just need help, and that’s where we come in: making the choices that suit your wallet. A designer is an artist: a creative person that has a vision, a “visual story teller”. So of course we are going to make your interior better! It’s not all about “dressing the nest” tho. We also understand what goes into making the interior of a home look amazing because we understand what goes into building the outside of a house: the structure…the skeleton. Just as Nicole Kidman and Adele can’t wear the same outfit to the Oscars, they’re built differently – so are homes. Most people don’t get that. They think that something that looks good in the mansion down the street will also look good in their bachelors flat. Not the case! Designers think outside the box and give a fresh perspective – well we try to anyway! The mind of a Designer is taught to think differently (well when it comes to interior spaces!). We can perhaps see things that others may not and we think laterally to provide fresh ideas and a unique perspective for a space. Simply put, we don’t want to re-create the front cover of the latest House and Leisure magazine, but rather be on it! Designers will “hook you up”You will often hear a designer say “I’ve got the perfect guy for you”. No, we are not trying to set you up with our “neighbors’-best friends-cousin”, but designers have access to a myriad of recourses and suppliers that are not often available to the general public. Because of our relationships built with tradesman and various subcontractors, our “little black books” are filled with numbers of people for the right job! Speaking from my personal experience, I live and breathe design. From my day job to this blog in my spare time, design is what I know and what I do, day in and day out. It’s not just my job, but a hobby and career that I’m truly passionate about, and that is reflected in every one of my creations. My list could go on and on……………. there are just so many benefits to hiring an Interior Designer! I hope this has shed a little light (the right kind of lighting, of course, because the right lighting is more important than you think!) on my profession, and the next time you are looking at tackling a project – whether a house/office/shop or restaurant, you will consider using an interior designer. Please check out my blog post next week as I will be showcasing another fabulous East London creative! If you know of anybody that I should get in touch with, or any cool project that you reckon deserves a mention on Styleast, please drop me a line: styleastblog@gmail.com. I’d love to hear from you! I have some hot-off-the-press news! A new online store has just launched into the SA market. 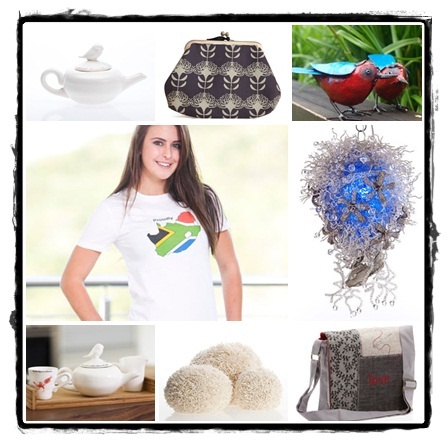 Selling proudly South African designer ware, Red on Top is an online store which is “a celebration of creativity, design and manufacture.” And most exciting of all: it is based in little old East London!!!! What the new breed of online shopping brands like ‘newbie’ Red on Top have realised, is that us consumers actually like to have our options narrowed down for us. Faced with infinite choice, most shoppers either freeze or flee. And so these stores have become curators – carefully selecting the best or coolest new items – unlike the “mass” stores . Red on Top sells world-class products that come from across the spectrum of shopping: from homeware to furniture and apparel. But all of these share three common characteristics: they’re fashionable, bespoke, and most importantly, absolutely everything is designed and manufactured right here in South Africa! This is something that the founders of the company (East London locals Richie and Karen Field) are extremely passionate about, and it forms the base of their brand, which is derived from the post-apartheid new South African flag and all the renewed sprit and energy that the flag brought. There is a definitive aesthetic or look of the products on the Red on Top website; it is a far cry from the afro-chic/safari look that is often associated with South African designer-ware. When asked about their product-choice, Richie and Karen have sourced items which they simply love, it’s a collection of all things they would like in their home or want to wear. Richie says that this ‘look’ is “inspired by the modern classics; which is characterised by simple, clean lines with a retro edge”. Like many others in this new wave of online shopping, Red on Top realises the value of the intangibles: uniqueness, simplicity, beauty, attention to detail and the power of a good story. So go check them out. They are proudly local, proudly South African, and celebrating South African design is something we should all support. Their website has just gone live and is ready to fulfil your retail therapy needs at the click of a mouse! They will also be having regular pop-up stores so watch this space for news of the first one… it’s not to be missed!